November is magical, and not just because Mariko and David got married then. You see, in November winter is new and fresh, and the thought of family gatherings is front of mind. Getting to spend a piece of November with Mariko and David was the perfect way to celebrate the season changing, their wedding sweet and sincere. 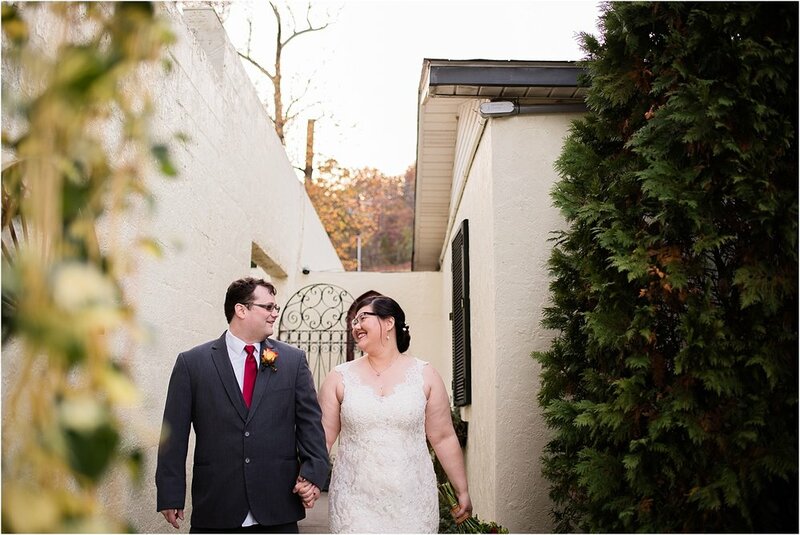 People from all walks of life traveled to celebrate these two in the beautiful Blue Ridge Mountains of North Carolina, and the couple took extra care to have their own backgrounds and interests were interwoven into their day. We started off the day with their first look. Mariko and David weren't about fuss and frills, but rather the moments together. In fact, this fleeting first moment ended up being David's favorite part from their wedding day. Seeing Mariko in her dress for the first time sparked the sweetest emotions. But I mean, how could it not? I'll admit, I'm a sucker for lacy, detailed dresses (and Mariko's was no exception) and it's pretty clear that Mariko's design was the perfect fit for her! We moved straight into getting those 'formal' shots for the wedding party, but formal is the last word you should use to describe this group. Having walked through different seasons with the bride and groom, knowing each other for years - this group was quick to smile, quick to laugh. When I first talked to Mariko on the phone months ago, I remember falling in love with their own unique style. She described their wedding as traditionally minded with her Japanses heritage, while incorporating their own unique, modern love story which tied into her and David's interests. Although these two themes sound like night and day, Mariko beautifully blended them in together to create a wedding that was completely their own. The 1927 Inn at Lake Lure is beautiful when you see it, and the private garden that the ceremony took place an absolute treat. I asked Mariko and David about their decision to get married at Lake Lure; "We enjoy the mountains of North Carolina and felt that a fall wedding in the mountains would be gorgeous," she shared. "The staff at the Lake Lure Inn was extremely helpful and offer a wonderful package." It was also a clear favorite for Mariko, as she loved the historic charm this pace radiates. Mariko and David's love story is sweet and simple - a modern take on finding love and keeping it. Originally they met online, and after emailing each other back and for for about a month they finally decided to meet for lunch. My favorite part, though, is when David asked Mariko to be his bride. Full of creativity and familiarity, his planned 'staycation' to celebrate Mariko being home for the holiday's would be more festive then it appeared. Mariko tells it best- "After we got settled into the room some wine and a cheese plate was brought up to us. We sat around to enjoy it, talked about various things. I could tell he was kinda nervous/anxious. Because of his nerves, he ended up ask me right there in the hotel room instead of following through his original plan. I said yes and the rest is history." After the ceremony, we got to steal the happy couples away for some photos together during the golden hour glow around Lake Lure. We always encourage our couples to be themselves, to focus on each other, to enjoy these moments and pause. Mariko and David fit together seamlessly, bringing laughter out of each other and beautifully followed their heart. At their reception, their beautiful blend of heritage and modern love shined through. Classic, autumn-esque floral design filled the reception hall, while Mariko incorporated traditional Japan in the photobook backdrop and the goody bags her mother hand-crafted. We were only at the party for close to an hour, but yet it was filled with joy. Mariko and David danced together with all of their close friends and family present, with the expectant, watchful eyes of those who love them most. Congratulations, Mariko and David! What a beautiful experience to be a part of your wedding at the Inn at Lake Lure - we wish you both the absolute best. "Special shoutout to Marian Mills, Meghan Pipp and Kiley Bickford for taking care of all the last minute day of details, and tying keeping me sane, in addition to my bridesmaids Layla Thompson and Anne Ferrante. Also a special shoutout to Campbell McLaughlin and Marian Mills for making announcements and manning the music."